No more bland mushroom pasta! This incredibly delicious Mushroom Stroganoff recipe packs a serious flavorful punch. 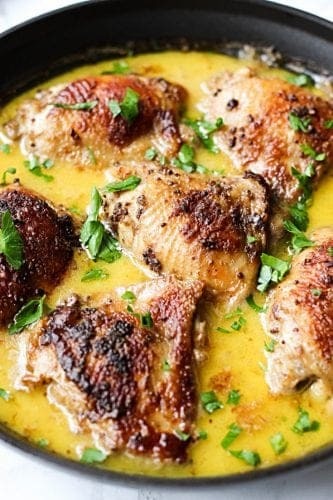 It’s so creamy and satisfying, perfect comfort food for long winter days. Friends, today I’m sharing with you my twist on a classic Beef Stroganoff. Since I’m little bit of a mushroom fanatic, I tweaked the original recipe and replaced beef with mushrooms. I’ve also threw in several unexpected ingredient that intensified the taste of mushrooms even more. Let’s face it, mushrooms can taste bland. I get it why so many people don’t like them, especially if talking about simple and most commonly found mushrooms like Portobello or White Button Mushrooms. And if you don’t properly season them, your final dish may lack some serious flavor. Spoiler alert…this situation is not going to happen with this recipe. 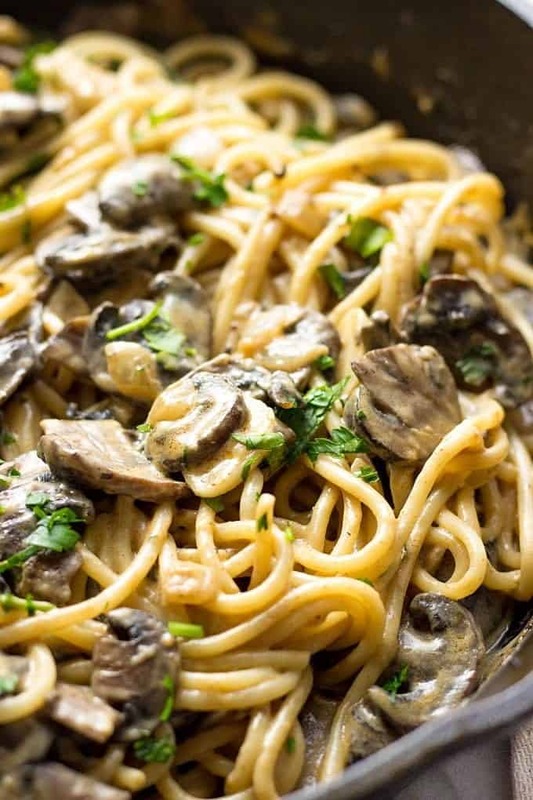 My creamy mushroom pasta is full of flavor. A little bit smokey, a little bit tangy and surprisingly easy to prepare. Mushroom Stroganoff is the adaptation of a famous and well known recipe of Beef Stroganoff created by French chef Andre Dupont in 1871. The dish is named after Russia’s Minister of the Interior Duke Aleksander Stroganov. The main players in this recipe are meat (in our case it’s mushrooms) and sour cream sauce. And although original recipe doesn’t include pasta, in my opinion it begs to be served over it. For my easy Mushroom Stroganoff Recipe I used Portobello Mushrooms which are the easiest to find these days. However, you can also make this pasta with Shiitake, Maitake or Oyster mushrooms which will bring even more aroma to the final dish. In this recipe, I also used chicken broth but you’re more than welcome to go with vegetable broth. If you scroll down to the recipe, you’ll notice that instead of a more tradition sour cream I used Crème fraîche, which I frankly speaking is obsessed with. I love cooking with it and it’s one of the most important ingredients in my Mustard Chicken and Eggplant Gratin. If you can’t find Crème fraîche in your local grocery store, no problem. And there’s one little trick that I use quite often and you can use it too. Simply mix sour cream and heavy cream in equal amounts and you’ll get a decent substitute of Crème fraîche. Easy-peasy! This Easy Mushroom Stroganoff is best when consumed right away. Reheating dishes containing mushrooms is not recommended. 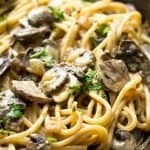 I like how this creamy mushroom pasta comes together in less then 30 minutes, which makes it perfect for lunch as well as quick dinner for the whole family. Are you feeling the creaminess yet? 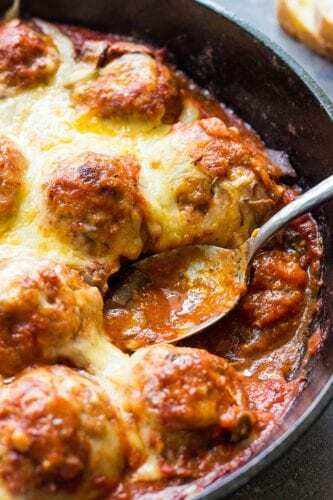 This recipe is so good and comforting! True winter meal that leaves you full and satisfied. 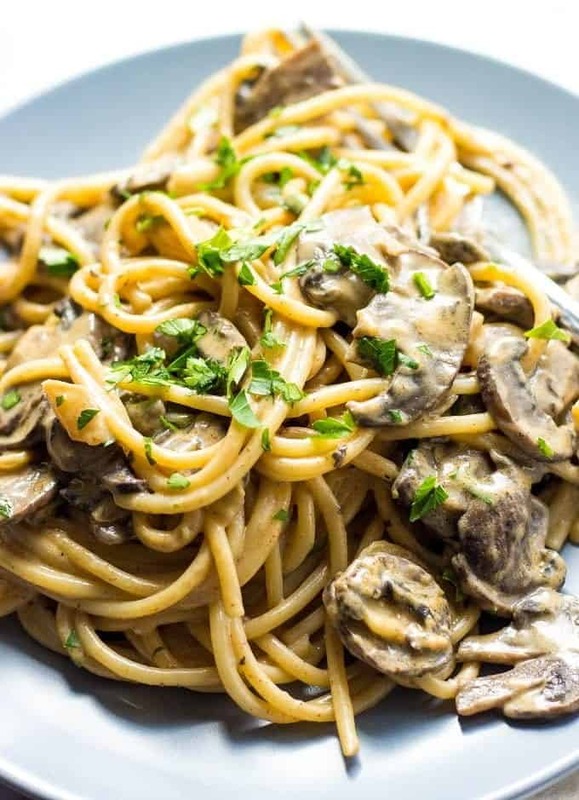 If you love trying out new recipes with mushrooms, give this best Mushroom Stroganoff recipe a try and you’ll be making it again and again. Mushroom And Pumpkin Risotto – easy fall-inspired recipe for busy weeknight meals. Farro Risotto With Wild Mushrooms – the flavors in this recipe are unbelievable. Just make it and see for yourself. Kale And Mushroom Lasagna – hearty and delicious vegetarian recipe for the whole family. If you make my Mushroom Stroganoff, snap a photo and post it on Instagram with a hashtag #lavenderandmacarons. I’d love to see your creations. 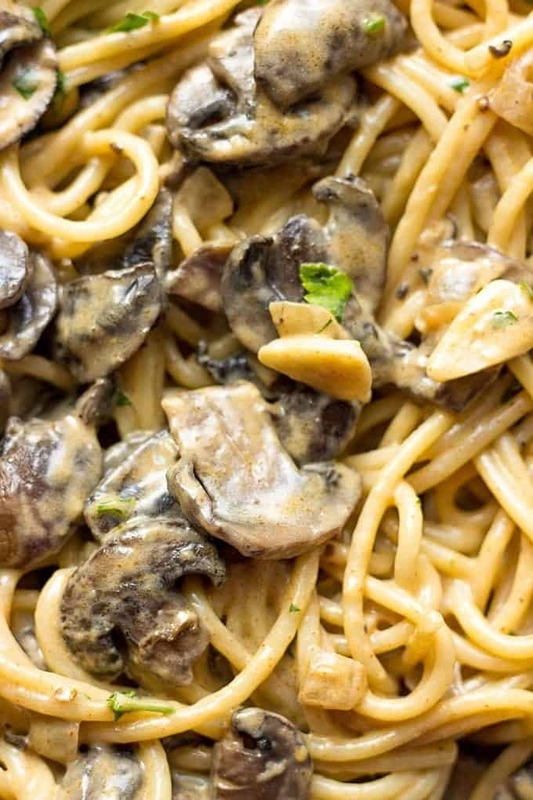 Creamy, flavorful, comforting and done in less than 30 minutes, this Mushroom Stroganoff is a delicious pasta dish for lunch or quick weeknight dinner. Bring a large pot of salted water to a boil and cook pasta al dente or until cooked. While pasta is cooking, melt butter in a medium skillet and over medium heat. Add onions and cook for 5 minutes. Add mushrooms and cook until all water evaporates and mushrooms are slightly browned, about 7 minutes. Stir in garlic and cook for 30 more seconds. Meanwhile, in a tall cup, combine flour, mustard, smoked paprika, salt and pepper. Add broth and whisk until no lumps remain. Pour the mixture into the mushrooms and cook until thickens, about 2 minutes. Stir in Creme Fraiche. Transfer cooked pasta to the mushroom sauce, stir to combine the ingredients and if necessary, add some pasta water to thin out the sauce. Serve immediately with a sprinkling of parsley. In my recipe I used Portobello mushrooms, however this dish would also taste great with White, Shiitake or Maitake mushrooms. You can substitute it by mixing equal amounts of sour cream and heavy cream.